When you go into your Doctors office, you will most likely see an EltaMD Ad for Sunscreen in the summer, a favorite for Dermatologists. We find our clients at the spa want to buy EltaMD, but with so many choices, they aren't sure which one to buy. 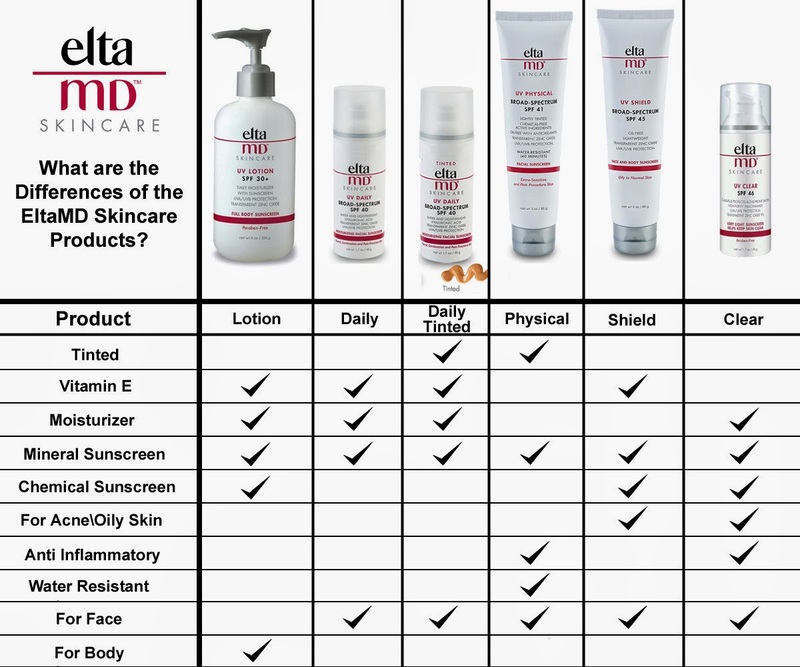 Here is a simple breakdown of the different products we offer, and may we remind you that we sell EltaMD with Coupons! Many people are fearful to change sunscreen or don't wear sunscreen at all because of horrible reactions they have had prior. If this is you, pick a sunscreen that is fragrance free and dye free as a must, all of EltaMD is free of these. Some people are allergic to Vitamin E, and Vitamin E is in a LOT of skincare products. Most brands, like EltaMD always make a choice without Vitamin E just for this reason. Zinc and Titanium Oxide are mineral sunscreen ingredients and extremely rare to find any allergic reaction. Chemical Sunscreen ingredients are commonly known to cause rashes and reactions. Pick only Physical or Mineral sunscreens to avoid bad reactions.